Britain at this time had influence in all the four corners of the globe, be it military, soldiers & sailors or trading companies, and with it football’s popularity spread rapidly. 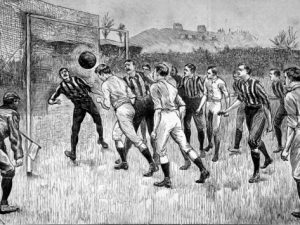 1800s Football in the UK was starting to change; more rules were beginning to emerge, we already had the goal kick (1869) the corner kick (1872) and in 1878 the referee used the whistle for the first time, although the whistle was not mentioned in the Laws of the Game until 1936. But it was in the early 1890s that the introduced of a number of dramatic changes to the laws of the game came into effect. 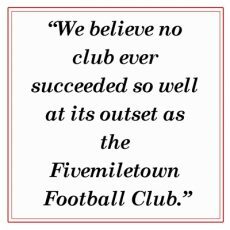 A few of the biggest changes included the introduction by Liverpool engineer John Alexander Brodie of the football net, there also came the invention of the penalty kick by William McCrum a goalkeeper himself from Northern Ireland. A lot of players at the time disliked the introduction of the penalty (kick of death, as it was originally called) on the grounds that a gentleman would never deliberately commit a foul. It is interesting to note that when the penalty came in, it was not taken from a spot but anywhere along a 12-yard line the ‘penalty spot’ wasn’t introduced until 1902. Penalties, of course, had to be awarded by someone, and you would think the referee would be the man to make such a decision, but at this time it was the two umpires, one from each team, who called the shots, and it was them, that each side could appeal, the referee was only on the line keeping time and only got involved if the two umpires could not agree, this led to lengthy delays, and was not an ideal solution, however as play became more competitive the need for officials grew. Following a proposal from the Irish Association, the referee was, for the first time allowed onto the pitch, and he was given the authority to award penalties as well as send someone off and give free kicks without having to refer back to the two umpires. This was a major change to the game. Each team were still required to nominate an umpire each, but their role slowly changed over the years to become linesmen or referee’s assistants as we know them today.